The year was 1906. Stacy returned from Belle Fourche, South Dakota to Manistee in May to bury his wife, Ida May Goodenow Thompson, who unexpectedly had died. 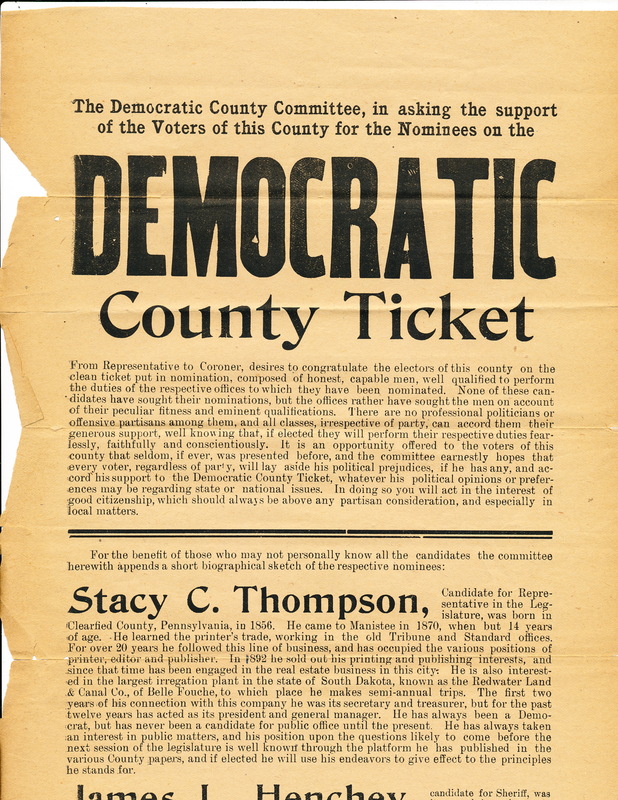 He became involved in the Democratic Party of Manistee County and was elected a delegate to the county convention. There, he was nominated to be his party’s candidate for the office of State Representative. No democrat had been successful at winning this seat in many years. Stacy set out to prove everyone wrong and to win. 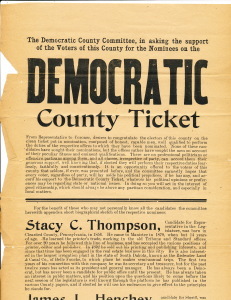 His biography read: Candidate for Representative in the Legislature, was born in Clearfield County, Pennsylvania in 1856. He came to Manistee in 1870, when but 14 years of age. He learned the printer’s trade, working in the old Tribune and Standard offices. For over 20 years he followed this line of business, and has occupied the various positions of printer, editor and publisher. In 1892 he sold out his printing and publishing interests, and since that time he has been engaged in the real estate business in this city. He is also interested in the largest irrigation plant in the state of South Dakota, known as the Redwater Land & Canal Co., of Belle Fouche, to which place be makes semi-annual trips. The first two years of his connection with this company he was its secretary and treasurer, but for the past twelve years has acted as its president and general manager. He has always been a Democrat, but has never been a candidate for public office until the present. 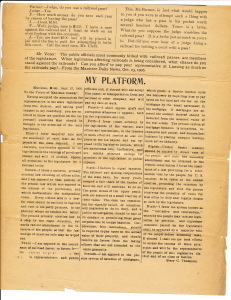 He has always taken an interest in public matters, and his position upon the questions likely to come before the next session of the legislature is well known through the platform he has published in the various County papers, and if elected he will use his endeavors to give effect to the principles he stands for. Having accepted the nomination for representative in the state legislature from this district, and asking your support in my candidacy, you are entitled to know my position on the important questions that should be brought to the attention of the next legislature. First – I favor majority rule and the enactment of such laws as the people of the state demand. 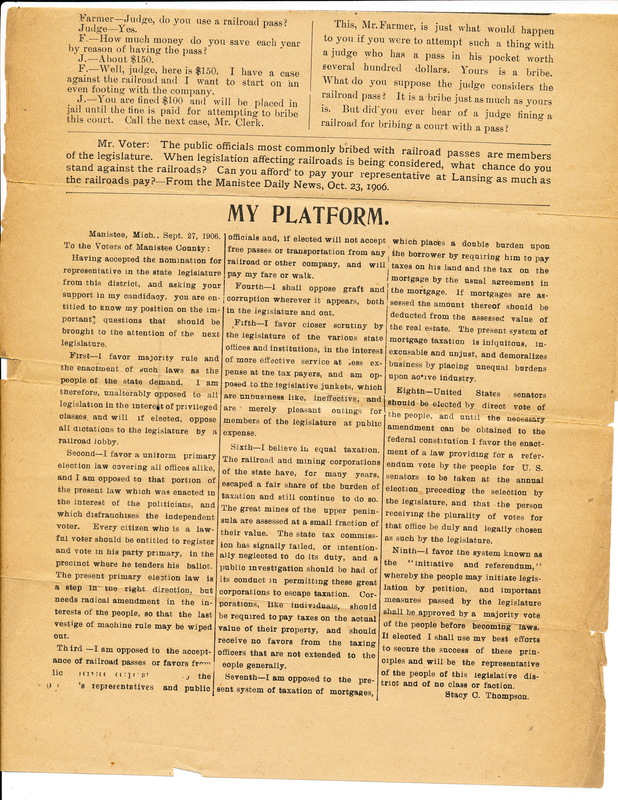 I am therefore, unalterably opposed to all legislation in the interest of the privileged classes and will, if elected, oppose all dictations to the legislature by a railway lobby. Second – I favor a uniform primary election law covering all offices alike, and I am opposed to that portion of the present law which was enacted in the interest of the politicians, and which disenfranchises the independent voter. Every citizen who is a lawful voter should be entitled to register and vote in his party primary, in the precinct where he tenders his ballot. The present primary election law is a step in the right direction, but needs radical amendment in the interests of the people so that the last vestige of machine rule may be wiped out. Third – I am opposed to the acceptance of railroad passes or favors from licensed corporations to the public representatives and public officials and, if elected will not accept from any railroad or other company, and will pay my fare or walk. Fourth – I shall oppose graft and corruption wherever it appears, both in the legislature and out. Fifth – I favor closer scrutiny by the legislature of the various state offices and institutions, in the interest of more effective service at less expense at the tax payers, and am opposed to the legislative junkets which are unbusinesslike, ineffective, and are merely pleasant outings for members of the legislature at public expense. Sixth – I believe in equal taxation. The railroad and mining corporations of the state have, for many years, escaped a fair share of the burden of taxation and still continue to do so. The great mines of the upper peninsula are assessed at a small fraction of their value. The state tax commission has signally failed, or intentionally neglected to do its duty, and a public investigation should be had of its conduct in permitting these great corporations to escape taxation. Corporations, like individuals, should be required to pay taxes on the actual value of their property, and should receive no favors from the taxing officers that are not extended to the people generally. Seventh – I am opposed to the present system of taxation of mortgages, which places a double burden upon the borrower by requiring him to pay taxes on his land and the tax on the mortgage by the usual agreement in the mortgage. If mortgages are assessed the amount thereof should be deducted from the assessed value of the real estate. The present system of mortgage taxation is iniquitous, inexcusable and unjust, and demoralizes business by placing unequal burdens upon active industry. Eighth – United States senators should be elected by direct vote of the people, and until the necessary amendment can be obtained to the federal constitution I favor the enactment of a law providing for a referendum vote by the people for U.S. senators to be taken at the annual election preceding the election by the legislature and that the person receiving the plurality of votes for that office be duly and legally chosen as such by the legislature. Ninth – I favor the system known as the “initiative and referendum,” whereby the people may initiate legislation by petition, and important measures passed by the legislature shall be approved by a majority vote of the people before becoming laws. If elected I shall use my best efforts to secure the success of these principles and will be the representative of the people of this legislative district and of no class or faction.